On any given day in Berlin, the Oberbaumbrücke bridge is a hub of activity. Built in 1732, this massive construction, with its Gothic towers and double-deck design, crosses over the River Spree. It's one of the most recognizable sights in Berlin, a standing reminder of the union of Friedrichshain and Kreuzberg, two boroughs formerly divided by the Berlin Wall. It is both a symbol and a thoroughfare. But for some, the Oberbaumbrücke is a place for music. It is a concert hall and a conservatory. It is a stage. 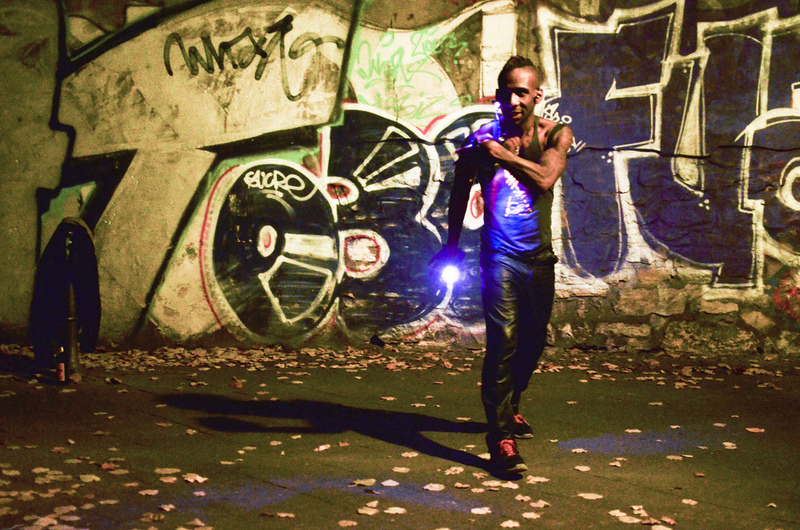 Onyx Ashanti, a Mississippi-born expatriate now living in Berlin, is what is commonly called a "busker" - a musician who plies his trade not in traditional settings, but wherever people are willing to listen. Like many buskers, Ashanti only has a few requirements - a place to play and a crowd to listen. But unlike most street musicians, Ashanti doesn't play a violin, or a guitar, or any other host of instruments you could pick up at the music store down the straße. Onyx plays a custom creation he calls his "beatjazz system." It is equal parts saxophone and computer, analog and digital. And he crafted it simply because his creativity just couldn't fit in the confines of traditional instruments. "I was feeling so restrained after years of playing a saxophone and a wind midi controller," says Ashanti. "I couldn't move the way I wanted because I was holding this horn. It felt like playing with a neck brace on." Ashanti wanted freedom of movement - to be able to let the music flow through him and express his craft not only through the sounds he created, but the movement of his body as he made them. Always a tinkerer, Ashanti decided the best path to take would be to create his own system using DIY electronics. The only problem was, he didn't really know much about building homemade electronics. "I had a bit of a background, as my dad was trained as an electronics technician, so we always had electronics gear around the house when I was a kid. But all of my recent progress is helped along greatly by access to the internet and forums. You can learn whatever you want and take as long as you need to understand it. It truly is like having a university in something the size of a notebook." So Ashanti set out to build his beatjazz system. He started by ordering an Arduino board from SparkFun.com, and started working on the task of integrating it with his music system. "I didn't even know these things existed before this project. I am overwhelmed by the idea of what will be possible a year from now." "I built my first true beatjazz system in 2007 and it consisted of my wind midi controller, and FL Studio running on a laptop with the loop machine from guitar rig and all the synths dumping into that, one at a time. That was very exciting for a time but then the limitations started to become overwhelming," says Ashanti. "So I took baby steps. First, I added an iPhone as a gestural controller by attaching it to the back of my hand and using its accelerometer to control parameters in my software. It was from there that the idea of a fully gestural performance system became slightly more feasible. When I discovered the Arduino Fio and XBee, it just blew it wide open. I didn't even know these things existed before this project. I am overwhelmed by the idea of what will be possible a year from now." Since his initial build, Ashanti's beatjazz system has taken on almost a life of its own. He has experimented playing with brain stimulation and robotics as part of his project. But for now, Ashanti is just enjoying playing his beatjazz system. "Music is a conversation rather than individual statements," says Ashanti. "I want to develop this voice to have that conversation, and to evolve that conversation as I evolve myself. Once you start thinking in terms of spatial and pressure sensors in the context of how you express yourself, the only limits are your ideas." Ashanti felt his creativity being stifled, so he invented a new way to make music—and let his geek shine. To submit your project, click here. Check out more about Onyx in this project build from Make Magazine and this blog post about his performance at TEDx. 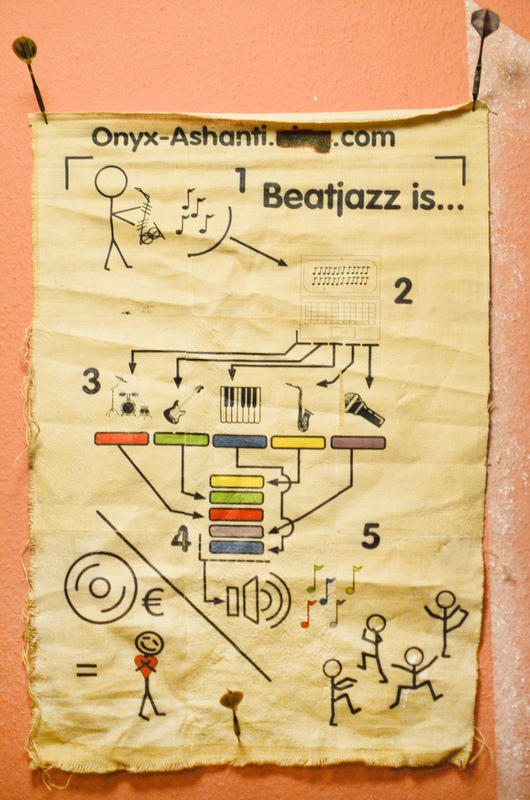 For a PDF case-study about Onyx and his beatjazz system, click here. Wow, this is so...futuristic. And he also got to show it off via TED.